Former U.S. secretary of state Henry Kissinger (L) speaks during the Senate Armed Services Committee hearing on Capitol Hill in Washington, Jan. 25, 2018, on global challenges and U.S. national security strategy. Two former U.S. secretaries of state on Thursday warned lawmakers of a marked rise in nuclear dangers stemming from North Korea's race to develop atomic weapons and the means to deliver them. Henry Kissinger, who served in the Nixon and Ford administrations, highlighted "a systemic failure of the world order" in dealing with nuclear proliferation. George Shultz , who served in the Reagan administration, called the spread of nuclear weapons "a major problem that can blow up the world." "The most immediate challenge to international security is posed by the evolution of the North Korean nuclear program," Kissinger said at a hearing of the Senate Armed Services Committee. He said Pyongyang's determined defiance of the international community could have a ripple effect elsewhere. 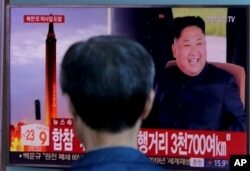 FILE - A man watches a TV screen showing file footage of North Korea's missile launch and North Korean leader Kim Jong Un, at the Seoul Railway Station in Seoul, South Korea, Sept. 15, 2017. Former U.S. top diplomat Henry Kissinger has called North Korea's nuclear program the "most immediate challenge to international security." "If North Korea could maintain its capability in the face of opposition by China and the United States and the disapproval of the rest of the world, other countries are bound to feel that this is the way for achieving international prominence and the upper hand in international disputes," Kissinger said. "The denuclearization of North Korea must be a fundamental objective. And if it is not reached, we have to prepare ourselves for the proliferation of weapons to other countries." Shultz expressed alarm about what he sees as changing attitudes regarding the use of atomic weapons. "President Reagan thought nuclear weapons were immoral, and we [the Reagan administration] worked hard to get them reduced," Schultz said. "I fear people have lost that sense of dread [about nuclear weapons], and now we see everything going in the other direction. The more countries have nuclear weapons, the more likely it is that one is going to go off somewhere, and the more fissile material is lying around, anybody who gets fissile material can make a weapon fairly easily." 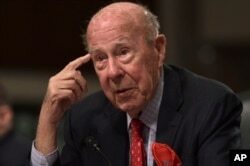 Former U.S. secretary of state George Shultz speaks during the Senate Armed Services Committee hearing on Capitol Hill in Washington, Jan. 25, 2018, on global challenges and U.S. national security strategy. Shultz noted that the rapid spread of advanced technology presents security challenges, with countries able to use inexpensive drones to deliver conventional bombs and other weapons rather than military aircraft. Kissinger concurred. "Compounding this [current threats] is the pace of technological development whose extraordinary progress threatens to outstrip our strategic and moral imagination and makes the strategic equation tenuous unless major efforts are made to sustain it," Kissinger said. Lawmakers who normally opine at length at committee hearings mostly held back in order to give more time for the testimony of two of America's best-known statesmen, both of whom are in their 90s and spoke with halting, frail voices. The committee's top Democrat, Senator Jack Reed of Rhode Island, agreed with the witnesses' testimony, though he expressed hope that China and Russia will cooperate more to limit the spread of nuclear weapons. "My sense is [that] they, too, fear a proliferation problem," Reed said. Absent from the hearing was the committee's chairman, Republican Senator John McCain of Arizona, who has been undergoing cancer treatment.